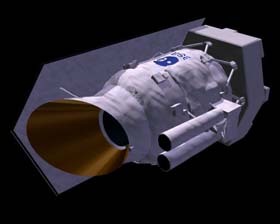 Infrared Space Observatory (ISO) was a European Space Agency orbiting infrared observatory, launched in 1995, that carried a cryogenically-cooled 60-centimeter telescope, a deep-infrared camera, two spectrometers, and photopolarimeter. ISO, which observed at wavelengths between 2.5 and 240 microns, not only covered a much wider wavelength range than its predecessor, the Infrared Astronomy Satellite, but was also thousands of times more sensitive and viewed infrared sources with much greater resolution. It operated from November 1996 to April 1998 – three times longer than IRAS – at which point the liquid-helium coolant was exhausted. Among of its most important discoveries is that a large fraction of young stars are surrounded by disks of gas and dust out of which planetary systems might form.